I don't collect Venezuelans unless there is Spanish text on the reverse or a different back. Typically, I also only collect clean backs. 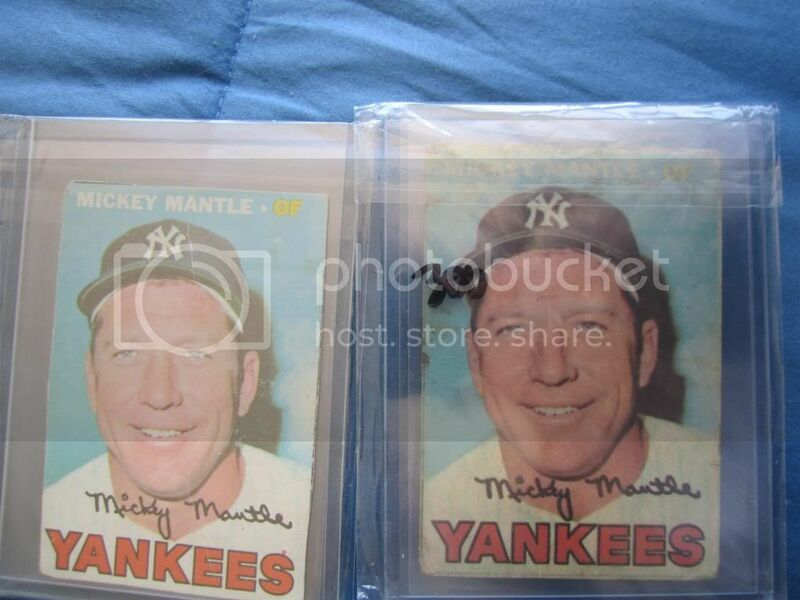 That makes the 1967 and 1964 sets my favorites. To date, has any packaging surfaced (wrappers, display boxes, etc.)? I collect Orioles team set sets and while it took a year of so to put together the 1964 and 1967 sets, the 1968 issue has been pretty much impossible. 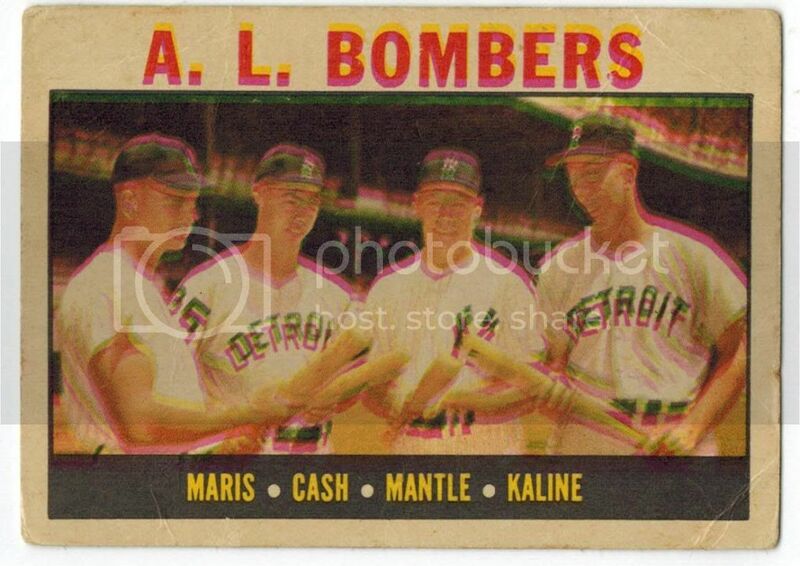 I'm probably very much in the minority, but the Retired cards from the 1967 don't do much for me. Guess I just don't like post-career cards. It is the first of its kind, though. Last edited by Orioles1954; 04-23-2015 at 09:26 AM. Orioles1954 I agree competely with everything you said, however, I do love the 1959 with Spanish copyright text. I collect them if I can get them. 1962, 1964 and 1968 are my favorites. I feel the 1967 retired set is grossly overrated. You can't even touch the Koufax card. Well put my friend. 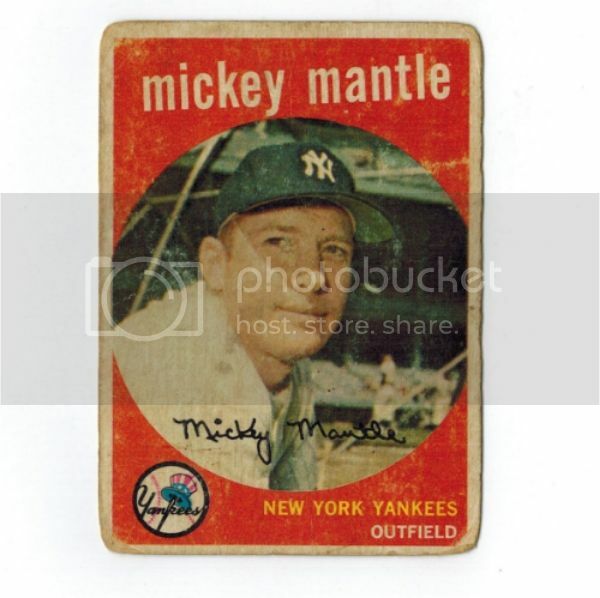 Last edited by 1963Topps Set; 04-23-2015 at 05:41 PM. This is my only Venezuelan card. Bought it from a fellow member when he upgraded to a nicer one. I have the 68 ryan and the 77 rose...definitely condition sensitive considering the paper and the fact that kids would glue them to albums....just something they did in their culture. we had 9 pocket binders, they had glue. I'm under the impression that Venezuelans weren't distributed in traditional wax packs with gum. Rather, they were issued with albums and glue. Not sure it is necessarily cultural, but simply how they were distributed. pretty sure, but not 100%, that they didn't come glued in the albums. they didn't come in "wax" packs either, rather a crude type of "envelope". again, in no way an expert. but I think the jist of it was to buy the "packs" and then buy the album and glue them to the album yourself to complete the set. Last edited by begsu1013; 04-23-2015 at 09:43 PM. I've been working on the 1967 Major League set for going on three years now and I can attest to it's difficulty. Some cards are just impossible. I missed out on one of the tough ones on eBay some months back and I seriously wonder if I'll ever see another example. I have managed to put together 35 of 150 so far. Great set, but tough. As far as the culture goes the tradition of mfg albums to paste cards into goes back to the prewar issues of all sports and nonsports. I collect boxing and soccer cards too and the Latin American cards from candy issuers and many tobacco companies are made with albums. We simply don't do that here. The few albums I can think of like Leaf were made with slots to tip in the cards. The only glue in albums I can think of were a few topps special issues like the bazooka stickers or the FB 4 on 1 from 1969. Not a bad scan... It actually looks like that. Last edited by Bestdj777; 04-23-2015 at 10:32 PM. Was Ashburn issued in any of the Venezuelan sets? Was Ashburn issued in any of the sets from Venezuela? If so what years? As far as issue, they definitely came in wax packs with gum. I know people who lived in Caracas and remember opening packs of them. No full wrapper or unopened pack has ever surfaced, but finding remnants of the pack on the cards is not overly uncommon. Albums were only issued for '64, '66 & '67. 1.) I've handled many Topps Venezuelan cards over the past ten years and have never come across wax staining. 2.) Unless they borrowed U.S. packaging, it seems very unlikely that at least a wrapper or panel of a display box has not survived. That makes me think the traditional 24 pack wax box may have not been employed here. Perhaps cello packs? 3.) Why were albums released for some sets and not others? 4.) Were packs limited only to Venezuelan major cities? 5.) Could finding "remnants of the pack" be confused with scrapbook residue? Last edited by Orioles1954; 04-24-2015 at 08:10 AM. Interesting.....starting in 1960, the Venezuelan set was issued every two years with the exception of 1967. It is also the only Venezuelan sets where the backs aren't replicated. The '67 set was made by Sport Grafico. I do believe Topps had a hand in those, although we'll never really know. I guess we can surmise that the Retirado is NOT the first Topps issue retro themed set. Is there any documentation, anywhere that links Topps as endorsing the Venezuelan set? How can we be sure all of these sets were not knock offs from Sport Grafico? Last edited by Orioles1954; 04-24-2015 at 12:00 PM. Bringing this thread back from the dead because I couldn't find another thread dedicated to all Venezuelan issues. New to the board and a big time collector of Topps Braves team sets. It is my mission to collect every base card Topps ever made of every Mil./Atl. Braves, from '51 up to today. So far everything's great and I have 68 through today completed, plus a lot of years more than half way done. While collecting I stumbled upon the existence of VZ cards and have been fascinated ever since. Not only that, but I expanded my search to include both VZ and OPC cards, as they were made by Topps. So, now I'm on the hunt for Braves VZ cards in the $5 to $10 range. 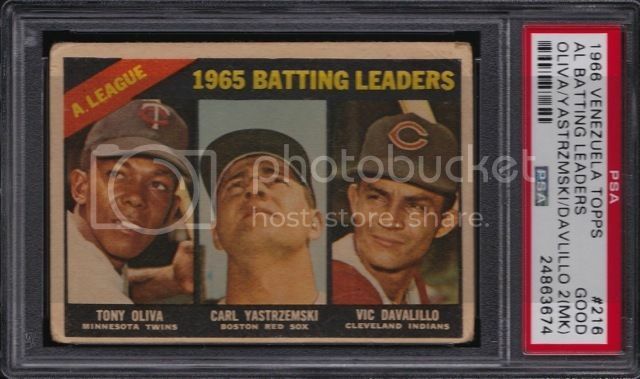 I've had great success on ebay, was able to purchase the entire Braves 1960 VZ set for only $35!, and recently on the Yahoo board, which I found through posting over at Beckett. Found some really great deals for some really great players, Mathews and Torre being a couple of them. Last edited by TheNightmanCometh; 01-16-2016 at 07:26 PM. I too have recently caught the Venie bug and have added 25 of them to my personal collection in the past 4 months. Speaking of team set projects, I am slowly tackling the 1968 Venie Red Sox set. If they're anywhere near as hard as the Braves team set then I wish you good luck. Gotta ask, who collects whatever quality they can get their hands on and who collects high grades? I'm more of a collect whatever I can type because finding high grades are hard and they're also very expensive. I only have one expectation and that's that the front of the card doesn't have any paper loss. It can have creases, round corners, discoloration, and paper loss on the back; doesn't matter. Just gotta see the front of the card. It was m pleasure because I love VZ cards. If I weren't so determined to collect all the Braves base cards I'd be collecting VZ cards in a second. I really do find them grossly under priced in certain ways, but do you think the demand will continue to increase enough for any of us to go out and snipe cheapies with the idea of selling later when the market increases? Or should we all just stick to collecting our special projects and let them float on? Been curious about that. Like many echoed sentiments here on the board - first and foremost I collect what I like. I have always loved the thrill of the hunt - Venezuelan cards have made for much more challenging "prey". I expect I will make a profit when the cards I own are sold. Regarding marketplace value - it would be taking a guess about the supply and demand equation - I feel relatively confident speculating that the supply side will not appreciably increase. Are there some left to discover - likely some, but not many - even if the population doubled - these are some rare cards. The demand side is the big question mark - will more people start looking for these rare Topps South American counterparts? I am surprised that the "completest" types have chosen not to define these as part of a complete Topps run - understandably from the perspective that it is unlikely any more than possibly 1 of them might complete a run. I only know of 2 collectors who have said they have a complete or near complete run of Venezuelan cards from 1959-1968 - they have been collecting Venezuelans for decades! Do more people learn about, get interested in and start pursuing these cards? That's the million dollar question! It wouldn't take many to start driving prices to the sky. The cards so far have been most popular with Team and player collectors. We'll see what the future holds. Old post, but man if you ever want to get rid of this let me know! Got some new VZs in yesterday! They aren't grade worthy, but I needed them for my collection so I'm stoked. Great cards Ryan! I had a copy of that 68 Sonny for sale not too long ago, before you resurrected this thread. I've already shown these in the Yaz thread, but wanted to show you my only 2 graded Venezuelans. I have 22 more that I'll be mailing to PSA this week or next. Dang! Those look awesome! Thanks for sharing. In my quest to collect every Topps Braves base card, I found myself collecting VZ as well. So far, I am 61 of the 90 cards possible, so I'm pretty stoked. I'm always looking out for new ones in my price range. Are you grading to sell later? No, I'm grading to keep. I'll have 3 for my Yaz master set (with hopefully many more to come), I'm gonna start a 1968 Venezuelan registry (soon will have 19 in slabs) and a '64 Venezuelan registry (soon will have 4 in slabs). That's awesome! Do you have your set listed somewhere where I can see them? Also, just a question for you VZ collector's out there. Some of the cards I got appear to be very dry, is that normal? I always figured VZ as a tropical climate. 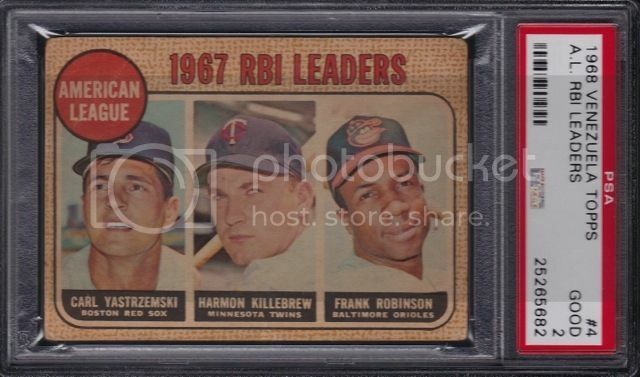 Also, best looking 1967 VZ I've seen yet, oh and it happens to be a Mantle...bidding's already exploded. Not yet. I'm mailing the 22 to PSA and when they're back I will start the registries I talked about. In the meantime, I'll PM you a link so you can see the rest of them. Picked these up over the last month or so. I've made a lot of headway, having the '64, '66, and '68 sets virtually completed. What I'm looking for now are '59s, '62s, and Aaron VZs. How could I forget this Niekro? Sorry some times it's a benefit to being simple but not in this case. Picked up a '64 Aaron and '66 Braves Team card, pics coming soon, both of which complete each respective run of Braves base cards in those sets. I'm still on the hunt for more Braves VZ cards, so if you have the following and are willing to sell, IM me.